Users of the Opera for computers browser can now easily share multiple bookmarks with their contacts. The new bookmark sharing option debuts today as a default option in the browser. The feature is available for Windows, Mac and Linux users. Until now, sharing lists of interesting products, offers and articles meant pasting multiple links, one after another, into a message. So, if it was twenty hotel inspirations or Christmas gift ideas, this meant entering 20 different URLs. With Opera’s new bookmark sharing feature, users can simply add their web findings to their bookmarks and press the “Share” button. This gives them a single, anonymous link to share with their friends or family. To see how simple it is, check out the video. With the new Opera 26, users can first save their findings by choosing a thumbnail for each new bookmark from the webpage they are browsing. 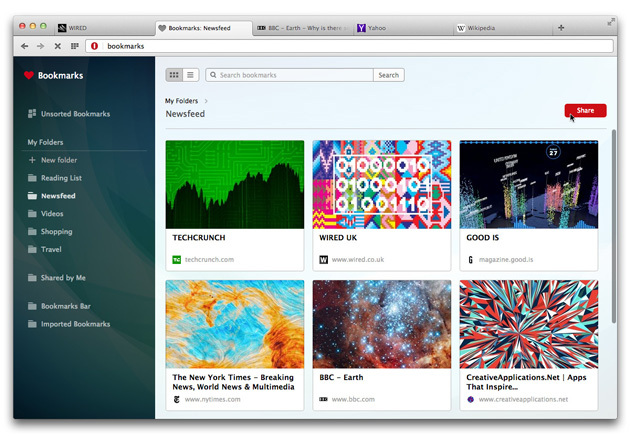 This transforms bookmarks into a collection of thumbnails that can be organized visually. When users click the “Share” button, all thumbnails and links will be uploaded to a special page, which they can then share via email, social media or a direct message. Here are, for instance, Opera’s favorite bookmarks. With this release, Opera for Linux has been upgraded to the stable channel. This means that Linux users will now get the same features, quality and stability as those in the Windows and Mac versions. A new, built-in print preview feature lets users preview print layout, right in the browser. New settings options make the importing of bookmarks and settings from the old browser easier. Mac users get a more native experience, as the Opera UI is now better integrated with the latest OS, Mac OS X Yosemite. Download the latest Opera from opera.com.